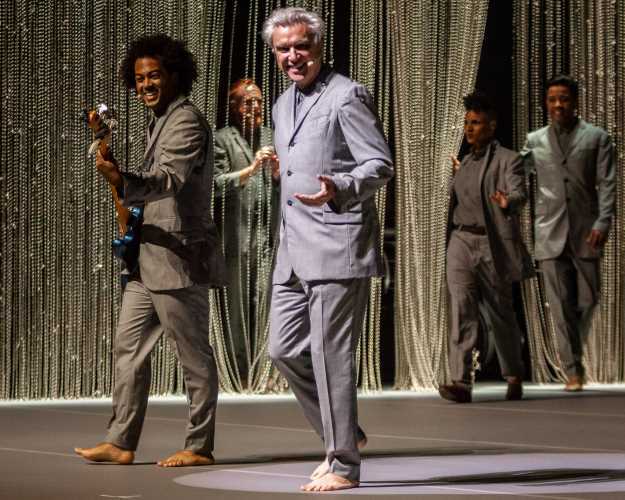 In press statements, David Byrne promised that his current tour supporting new album American Utopia would present his most ambitious show since staging the 1983 concerts that became the Jonathan Demme-directed film Stop Making Sense with Talking Heads. On the first of three nights at Chicago’s elegant Auditorium Theatre, Byrne and his cohort of 11 dynamite musicians proved that the claim was no mere boast. The concert set what may be an insurmountably high bar for anyone else hoping to claim the title of best rock or pop show of 2018. It was a dazzling display for the eyes, a fascinating feast for the ears, and included plenty for the head and heart as well. Like Stop Making Sense, the show began with a barely-adorned stage. Under a single spotlight sat a simple wooden chair, a card table, and a model of the human brain. Byrne emerged barefoot in a sharp gray suit and held the brain aloft like Yorick’s skull while singing “Here” alone on stage. As Byrne’s neuroscience-savvy lyrics unfolded, he pointed out areas of the brain and their functions. Nerdy? Well, sure. But it was the kind of subject and song that Byrne has uniquely rendered with a wide-eye sense of fascination, studiousness, and charm, just as he once did when singing about mundane but relatable topics like finding a city to live in. Beginning with Grown Backward track “Lazy,” Byrne was joined by members of his similarly-attired band. The players worked free-range, untethered to fixed workstations by use of instrument harnesses, guitar straps and wireless units. The group joined Byrne in tightly-choreographed dances to match spirited performances of songs like the urbane “I Should Watch TV” from 2012’s Love This Giant (a collaborative album with St. Vincent). The box-shaped stage was walled by a curtain of chains. These served as a backdrop for fascinating displays of light, color and shadow during songs like “Blind,” as well as providing a fluid point of entrance or exit for the musicians as the scale of the group changed from song to song. “Slippery People” featured Chicago native Bobby Wooten, who added ecstatic dance to the slinky funk of his bass. Milwaukee guitarist Angela Johnson-Swan took the spotlight during an encore performance of “The Great Curve” with a mind-bending guitar solo that would have done Adrian Belew very proud indeed. “Burning Down the House” was elevated by a riveting solo from percussion director Mauro Refosco, a Brazilian musician and veteran sideman of artists including Stewart Copeland, Red Hot Chili Peppers and Thom Yorke. While stoking the search for joy, Byrne also gave time to other important topics. Following “Dog’s Mind” and its depiction of political charades, Byrne encouraged people to visit a booth for Headcount in the lobby. “They’ll register you to vote instantly,” he said, stressing the importance of turning out for regional and local elections. “Our local representatives can make a bigger difference in our lives than the fools at the top,” he added. American Utopia track “Bullet” was the main set’s most unsettling song, sung in the stark light of a bare lamp bulb. The childlike, matter-of-fact description of a carefree bullet passing through chambers of human satisfaction, love, and memory had a truly chilling effect. The theme echoed in the band’s final encore performance of Janelle Monáe’s “Hell You Talmbout,” which Byrne described as sadly still relevant since its release three years ago. “Today, with her blessing, we have continued to update it.” The straightforward song called out names of many whose lives were cut short by violent abuses of privilege and power. Byrne’s message during the concert was twofold. Beginning with himself, he urged people to remain open to happiness. At the same time, he encouraged a commitment to communal action, with no blind eye to injustice. Both sides of the message bear startling elements upon reflection. Byrne’s appeal has long hinged upon his ability to view everyday scenarios from uncommon angles. Allowing those ideas to trickle into the world may be an even greater artistic feat than his affinity for enduring, beautifully-skewed pop hooks.